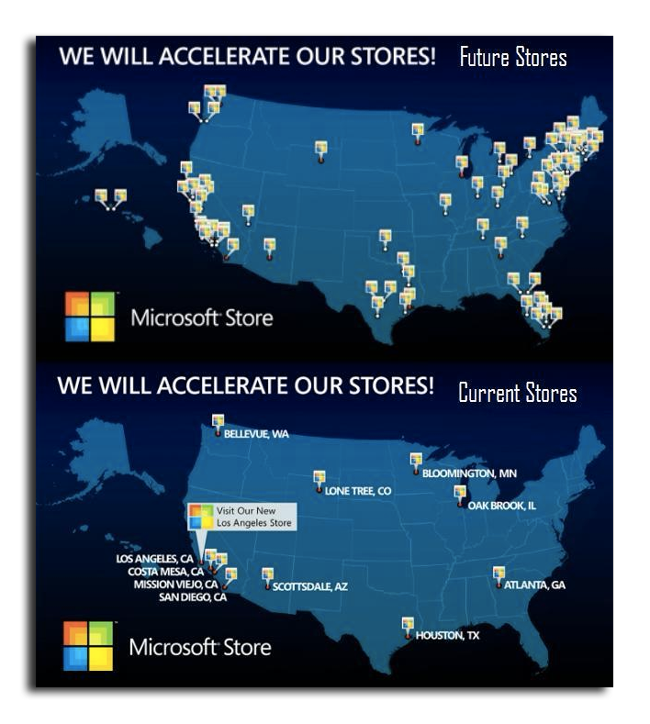 Microsoft plans to massively expand its retail presence in the U.S. in the next 2 to 3 years, with an aggressive goal of 75 new stores to take on Apple's own retail operations. The plans are said to be part of the company's effort to expand the "Microsoft story," according to a report Wednesday from Neowin. An accompanying map shows clusters of stores in California, Texas, Florida and the Northeast. Microsoft gave a presentation at its Worldwide Partner Conference on Wednesday. Currently, the Redmond, Wash., software giant has a total of 11 stores across America, mostly in California, with a new one that just opened in Los Angeles. "Also shown off during this presentation was that an Apple retailer in Latin America was showing off Apple hardware running Windows 7," the report said. "Microsoft used this to poke fun that Apple makes fantastic hardware but their OS is still behind Windows 7." Microsoft first announced in early 2009 that the company planned to open new retail stores, in an approach that mimics Apple's own wildly successful retail operations. The company pushed hard with viral marketing buzz, and even poached employees from Apple's retail operations with the promise of pay raises and compensation for moving expenses. In one instance detailed by AppleInsider, Microsoft was able to court an Apple retail market manager who had recently left the company. That person said they were offered a pay raise and were then allegedly asked to contact employees they had previously worked with at Apple in an effort to recruit them. Little has been said of Microsoft's retail operations since their debut in 2009, but Wednesday's latest development indicates that the company has high hopes for the future of its brick-and-mortar ventures. The news comes as it was revealed that Apple single-handedly accounted for one fifth of all sales growth by publicly traded American retailers during the first three months of 2011.